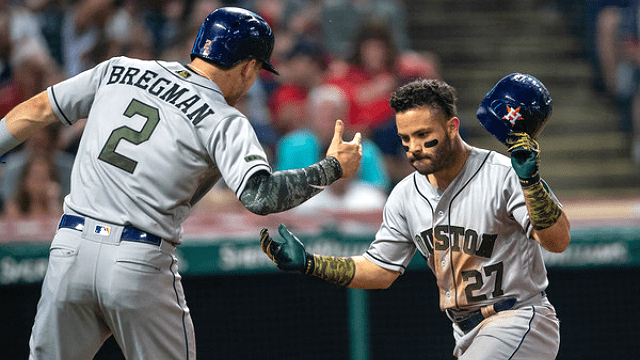 The Yankees road trip continued to Houston and the series began with a familiar story: another wasted another gem by Masahiro Tanaka as the much-hyped bullpen blew a late lead and instead the Yankees end up with a painful loss. Since joining the Astros in late-summer 2017 — and prior to Monday — Justin Verlander had dominated the Yankees, allowing just two runs in 30 2/3 IP (0.59 ERA). Somehow the Yankees finally made him look human, scoring three runs in six innings off him. Aaron Judge had two hits — including an opposite-field laser shot into the rightfield seats — and a walk; entering this series, Judge was 0-for-13 with seven strikeouts against Verlander, his worst 0-fer vs any pitcher. Tanaka was stellar in holding the Astros to one run on three hits in six innings. His 1.47 ERA is easily the best of his MLB career through this first three starts. It’s also a near-360 reversal from his notable early-season struggles in recent years, when he had a 5.19 ERA last year and a 8.36 ERA in 2017 after three turns. Adam Ottavino allowed the go-ahead run after issuing a one-out walk and consecutive singles by Michael Brantley and Carlos Correa, the latter a dribbler towards first base that went 22 feet and had an exit velocity of 28.9 mph. Prior to that meltdown, Ottavino had not allowed a hit or run in his first five appearances of the season. Another day, another game, another brutal and crushing loss thanks another bullpen implosion. Luke Voit staked the Yankees to an early 1-0 lead with a solo homer to dead-center field. We know Voit has big muscles, and one good use for those big muscles is destroying baseballs to the farthest reaches of the park, notably deep center field. Since the start of last season (through Tuesday), 384 players had hit at least 40 balls to center; Voit’s 1.065 slugging percentage on batted balls to center ranked first in that group. On Tuesday it was Jonathan Holder and Chad Green’s turn to play the starring roles in the late-inning collapse. Holder allowed the game-tying run in the seventh on back-to-back doubles by Alex Bregman and Michael Brantley. Through Tuesday, Frazier had three batted balls hit to him with a catch probability of less than 99 percent (routine play) but greater than 50 percent (50/50 play). He missed the catch on all three of those defensive plays. Green took the loss, charged with the three runs allowed in eighth. It was the first appearance of his career that he gave up at least three runs and got fewer than three outs. Two losses (Monday and Tuesday) when leading at the end of the sixth inning; only Cubs and Rockies had more (3). Yankees last year had only five such losses, tied for fewest in MLB. Four losses when tied at the end of the seventh inning, the most in MLB this season. Yankees had only seven last year. At least there was no lead for the bullpen to blow on Wednesday night. That’s about the only “positive” thing you can say about the terrible 8-6 loss they suffered as the road trip came to a depressing end in Houston, capping the first-ever series sweep by the Astros over the Yankees. Is this a good time to mention that there are still 150 games left in the season? The Yankees fell to 4-6 when scoring first this season. Last year they had the second-best record when scoring first, winning 81 percent of those games. On average, teams that score first go on to win 66 percent of the time. This was the 11th time in 12 games this season that the Yankees held a lead … and they are 5-6 in those games. Last year they had a .797 win percentage in such games. The only other teams this season with a below-.500 record when leading at any point in the game are the Red Sox (3-6) and Royals (2-7). Eight of their 12 games have been decided by two runs or fewer, and they are 2-6 in those games, one of the five worst marks in MLB. Last year the Yankees had a .561 win percentage in those games, seventh-best in the majors. Two years ago, the Astros visited the Bronx for an exciting four-game, regular-season series which led to my guess that Yankees-Astros was the next great MLB rivalry (outside of Yankees-Red Sox, of course). Since that article, the two teams have played a seven-game ALCS and two hard-fought, regular-season series going into this week. They’ve been must-watch games in the sense that any game between two of the best teams in the league are must-watch. But has this become a rivalry in a real sense? There are a few criteria which are hallmarks for a rivalry: Close postseason matchups, marquee players that are villainized on the other side, proximity or enough in-season matchups, sustained success for both franchises concurrently and, finally, the intangible hatred born out of nothing in particular. The Yankees and Astros have the first criteria down pat thus far. The two teams were pitted against one another in the postseason twice, once in the winner-take-all 2015 Wild Card Game and a second time in the 2017 ALCS, both going the Astros’ way. In 2017, Games 2 and 4 were classics and Game 7 was close into the middle innings. With a weak American League field, the chance of another New York-Houston showdown is high. Say what you want about the Mariners’ 10-2 start, but the Astros are an overwhelming favorite to win their division for at least the next two seasons. The Yankees have to contend with the Red Sox and Rays in the East, but they’re still highly likely to make the postseason, which either pits them directly against Houston or forces each team to win a series to meet in the ALCS. Not guaranteed, but easy to imagine. Marquee players, each team has more than enough. Aaron Judge may be the face of baseball while Jose Altuve and Justin Verlander are veritable stars themselves. Alex Bregman, Carlos Correa and Gerrit Cole are also top-tier talents. 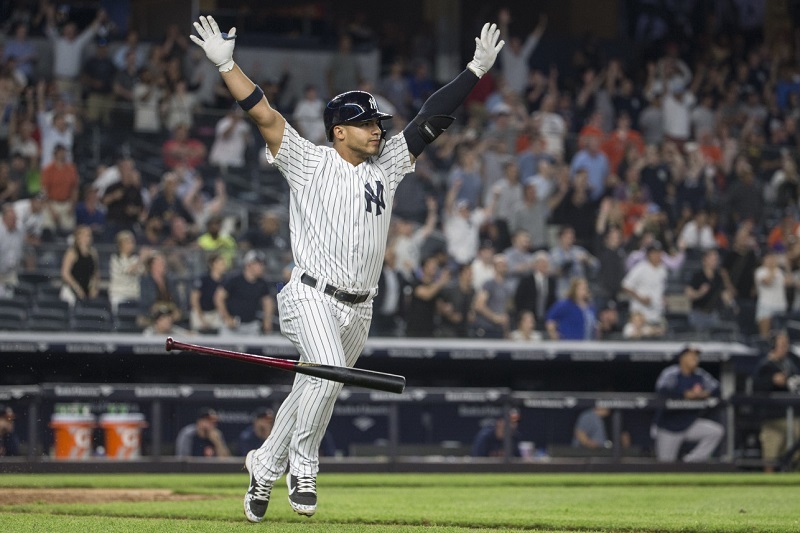 Giancarlo Stanton had the largest contract in baseball until a month ago while Gleyber Torres and Gary Sanchez are on the cusp of becoming household names. When I wrote this the first time, I thought Dallas Keuchel could play the villain for New York. He’d dominated the Yankees time and time again, including in the Wild Card Game, and he provided a nemesis, albeit without the charisma of Pedro Martinez. With Keuchel a free agent and unlikely to come back to Houston, there are two candidates coming to mind: Bregman and Verlander. Bregman has the confidence of a superstar and isn’t afraid to let anyone know. He hadn’t quite hit the spotlight in 2017, but he owns it now, likely surpassing Correa. When it comes to the Yankees, it’s not hard to imagine him failing to hold his tongue when saying he thinks Houston is better. Verlander goes without saying. He was the 2017 ALCS MVP and his first taste of the postseason was helping to eliminate the Yankees in 2006. The future Hall of Famer is now locked into Houston through 2021 and though he’ll be 38 that season, he still possesses top-of-the-rotation talent. He holds a certain amount of real estate in Yankee fans’ heads. The regular season matchups between the two clubs have been consistently close and entertaining in recent seasons. The teams, however, are limited to a maximum of seven regular-season contests, as opposed to the 19 times of a division opponent. That’s a dozen fewer times to create familiarity and contempt, to find two teams pointing fingers and throwing hands in a brawl gone viral. As for that intangible, there was the Judge-Altuve MVP battle of 2017 that caused some consternation on each side. The photo of them, adorning this article up top, from the 2017 season is a lasting image superimposing the extremes of baseball stardom, though it hasn’t translated into a linkage of the two teams. Still, the Yankees and Astros remain on a collision course for the next few years. Predicting beyond the next five is a pointless exercise, so you can even say for the foreseeable future. Each team knows the other stands in the way of their World Series goals, thus heightening their matchups. Is all of that good enough for a rivalry? Right now, no, just a handful of entertaining games a season. Houston may be the Yankees’ second or third-biggest rival for a title, but fans aren’t adding curse words to the opposition’s middle names. There just hasn’t been that intangible. As a Yankee fan, you know in your bones you hate the Red Sox and can even churn up some feelings for the Orioles, Blue Jays or Rays during a period of sustained success. But that visceral feelings don’t extend to the Astros. Not yet at least. Until the teams have created some true dislike or have played another long playoff series, they’re not rivals, just strong competitors. Yankees-Red Sox will have to do for now. You’ve tried the rest, now try the best. The Yankees travel to Houston to face arguably the best team in baseball for an early-season showdown. At 5-5, the Astros are off to an uneven start mirroring the Yankees. They dropped three of four in Tampa Bay and two of three to the Rangers before sweeping the Athletics. On the position player side, Houston has a 114 wRC+ as a team, good for ninth in baseball after finishing right near the top a year ago. The Astros’ pitchers have been as advertised with a 2.49 ERA and MLB-best 23.7 percent K-BB rate before allowing eight runs in a thriller Sunday. While their rotation has undergone significant upheaval, the team remains largely the same, albeit with the additions of OF Michael Brantley and SP Wade Miley. The Astros are remarkably healthy. Lance McCullers (Tommy John) and Joe Smith (Achilles) went under the knife this offseason, and they’re the only injured players on the 40-man roster. Sometimes, you get lucky and you face a team’s worst starters: The Yankees had no such luck. The Astros are bringing their top pitchers into this series. Locked up for another two years before the season, the 36-year-old Verlander faces the Bombers in his third start of the season. He worked around a solo homer on Opening Day for a win but allowed 10 baserunners in four-plus innings of work in Texas. The former Cy Young award winner averaged 94.5 mph on his fastball, down from 95.1 a year ago, and turned to his changeup more often in these early starts. However, he’s still a fastball-slider pitcher with the slow curve and only occasional change. The spin rates on his pitches remain close to last season’s pitches. The Yankees can’t seem to get in good hacks against Verlander, who shut them down to the tune of one run, 19 strikeouts and no walks in 14 2/3 innings in two starts last May. Aaron Judge is 0-for-13 against the right-hander with seven strikeouts while Greg Bird and Brett Gardner each have a homer off him. While the Yankees are plenty familiar with Verlander, Cole is a different animal. The former New York first-round pick hasn’t faced the Yankees since 2014 and has a limited history against everyone but D.J. LeMahieu. Cole is coming off a career year in Houston and has continued despite taking tough luck losses in his first two starts. His 19:3 K:BB ratio tells a different story as the right-hander can rack up strikeouts as much as any pitcher. He primarily works off an upper-90s fastball with a high-80s slider, reflecting Verlander with an occasional curve and changeup. The spin rate on Cole’s four-seamer has been significantly higher this season (2542 rpm in 2019 vs. 2379 rpm in 2018) and he’s had a higher swing-and-miss rate in the small sample. Meanwhile, he’s yet to give up an extra-base hit on his slider after allowing just 12 a year ago. Not only did McHugh start a podcast this winter, but he also moved back into the Astros’ rotation. He was All-Star worthy — although not elected — in a one-year stint in Houston’s bullpen, sporting a 1.99 ERA and striking out 94 batters in 72 1/3 innings. He became a relief ace for the Astros, who needed him fully stretched out after letting Dallas Keuchel and Charlie Morton leave. The 31-year-old Georgia native has put together two strong starts to begin the season with 13 strikeouts, four walks and six hits in 11 innings. His fastball velocity has gone back down to right around 90 mph (averaged 92.1 in the bullpen) and he’s responded by utilizing his slider nearly as much as his four-seamer and cutter combined. His slider and curveball generally work as McHugh’s out-pitches, which has led to his career-low usage of his fastball. He also works in a changeup but primarily goes with the slider, curve, four-seamer and cutter. McHugh is also just a good dude who grows peppers in his garden back home. That isn’t relevant to his pitching, but he is a good follow on social media. Safe to say, this is going to be a step up from the Orioles’ lineup. On the bench, they have RHH Tyler White (94 wRC+), who plays first and DHs along with INF Aledmys Diaz (67 wRC+), OF Jake Marisnick (157 wRC+) and C Max Stassi (-76 wRC+). Houston used closer Roberto Osuna and setup man Hector Rondon for an inning each Sunday while getting two innings from Josh James. James is likely unavailable Monday now having pitched consecutive days. Osuna’s main setup man is usually the recently-extended Ryan Pressly while Will Harris and Chris Devenski work in middle relief. Framber Valdez and James can give Houston some length after working as starters up until this season. The Yankees’ righty-laden nine was felled by the likes of Nathan Eovaldi and Rick Porcello last October and with Houston the overwhelming favorite to win the AL West, the Bombers likely have to go through the trio facing them this weekend. Can they finally catch up to Verlander? It remains to be seen, while their matchup with Cole will be a newer test. Masahiro Tanaka and James Paxton have each proven they can handle this Houston lineup. In fact, Paxton went 4-0 with a 2.05 ERA against a similar lineup a year ago. Loaisiga, however, has never had a start against an offense this potent. He surely won’t be facing them for that long, but whether he can even go two turns through is a question mark. Are you tired of discussing the Yankees’ offseason? Why did they sign DJ LeMahieu over Manny Machado? Are they really going to pass on Bryce Harper? The arguments have been exhausting, even with the clear merit to the discussion. While the Yankees have passed on the generation talents, they’ve filled the obvious holes in their roster going into the offseason. They needed three starters, two relievers and a stopgap at shortstop. With James Paxton, Adam Ottavino, Troy Tulowitzki and the re-signings of CC Sabathia, J.A. Happ and Zach Britton, they’ve done just that. Add in LeMahieu as insurance for the entire infield, and the Yankees have addressed their immediate issues while going over the luxury tax. Is that enough? We’re not going to know for a while. There’s plenty of injury and performance risk in their winter acquisitions and I’d be lying if I said that Harper or Machado wouldn’t alleviate much of those concerns. When you look at the Yankees’ competitors, their offseason improves immensely. The Bombers don’t deserve a gold medal for doing the perceived minimum to upgrade its roster, but the other American League contenders certainly deserve demerits. The Red Sox won last offseason with the signing of J.D. Martinez and that led directly to a World Series title in the fall. You can try and rest on your laurels after a season like that. The Red Sox have done just that. Boston re-signed Nate Eovaldi and Steve Pearce and … I’m at a loss here. Maintaining a good roster is one step to an offseason, but the Red Sox have allowed their bullpen to atrophy, seeing Joe Kelly leave (less of a concern) and Craig Kimbrel sit on the market, leaving a giant question mark at the back-end of the bullpen. With a handful of low-risk relief signings (Brian Ellington, Jenrry Mejia, Dan Runzler, Colten Brewer and Zach Putnam), they’re bound to hit on someone, but that doesn’t replace the Kimbrel-sized hole in their bullpen. With about $240 million in committed salary, Boston sits right near the third tier of the luxury tax and appears ready to forego further improvements to stay under. Unlike the 2018 Astros, which added Gerrit Cole to a World Series champion, they’ve taken a clear step sideways. The 2019 Astros also look to have taken a step sideways. Their big offseason move was to add Michael Brantley, which was undeniably smart. He shores up left field, a revolving door for Houston at times, and gives them a lefty bat with plenty of contact at the top of their lineup. Combine that with some more health on their infield and the Astros’ offense should take a step forward. However, they’ve also seen Charlie Morton leave while Dallas Keuchel and Marwin Gonzalez are likely following him out the door late in this offseason. Add in Lance McCullers’s Tommy John surgery and they’re experiencing significant turnover in their rotation. Wade Miley is … fine. But four of Houston’s five starters will be free agents after the season and the fifth starter has all of 27 2/3 MLB innings under his belt, including the postseason. Houston’s young talent in the pipeline gives them a wild card for this upcoming season. Top pitching prospect Forrest Whitley should be ready for a call-up by midseason and could supplement the rotation. With a bullpen that may need a deadline upgrade, they have the MiLB players to pick that up via trade. Beyond those two teams, it’s not like there’s a clear elite contender to rise up. The Indians have done nothing but hemorrhage talent from their roster, seeing multiple relievers, Brantley and Edwin Encarnacion leave with Carlos Santana and Jake Bauers as the only additions thus far. The Athletics remain injury-riddled in the rotation with their bullpen losing their veteran reinforcements from the 2018 deadline. The Angels didn’t address their rotation or lineup holes in any significant way. The Twins … meh. Tampa Bay represents the only other competitor to improve by bringing in Morton, though it remains to be seen if they can recreate the opener’s success in 2019. The Rays also boast a top-five farm system to tap into for MLB talent or trades if they compete yet again. All of this is to say Yankees have had a strong offseason by comparison with other teams standing pat or letting holes open up. Did they bridge eight wins with the Red Sox and close the talent gap with the Astros? That’s up for interpretation, but they seem neck-and-neck at worst. Fangraphs projections have the Yankees at 96 wins, ahead of Houston and just one game behind Boston. Furthermore, Paxton has been the best outside acquisition of any AL contender and Ottavino likely sits in third behind Brantley. No one signing would guarantee a division title or a World Series title. Still, the Yankees have spent much less than they can and there are perfect complements to the team’s core available in free agency. However, the Yankees aren’t the only team failing to jump at the opportunity and while that could change at the drop of a hat, the American League’s collective inactivity gives the Yankees a leg up in early February. For one night, at least, the old adage “good pitching beats good hitting” held true, as the Yankees were totally dominated in Monday’s 5-1 loss by Justin Verlander and a historically great Astros pitching staff. Verlander spun another gem, and in two starts against the Yankees this year, has a 0.61 ERA with 19 strikeouts and no walks. With this being the final series between the two clubs during the regular season, Verlander became the first pitcher — since earned runs became official in 1913 — to strike out at least 15 batters, walk none and post a sub-1.00 ERA in a single season against the Yankees. One of the guys that Verlander handcuffed was Aaron Judge. After going 0-for-3 in their latest matchup, he remains hitless in 13 at-bats against Verlander with more than half (7) of those outs via strikeout. The 13 at-bats are his most versus any pitcher he doesn’t have a hit off in his career. Domingo German flashed electric stuff but also suffered from inconsistent command. His final line was a mixed bag with three earned runs (plus an unearned run) allowed on five hits, including a homer, and seven strikeouts in 5 2/3 innings. The good? He was excellent in missing bats and getting hitters to chase his pitches. He matched a career-high with 16 whiffs, and 11 of them came on pitches out of the zone. The only other guys this season to get that many out-of-zone swings-and-misses (11) in a game against the Astros were Trevor Bauer and Corey Kluber. Pretty good company for the rookie! The lone offensive highlight for the Yankees was Greg Bird taking Justin Verlander deep in the seventh inning. It was the first homer that Verlander allowed to a left-handed batter all season; the 120 lefty swingers he had faced entering the week were the second-most of any pitcher in baseball this season who hadn’t yet allowed a home run to a lefty. 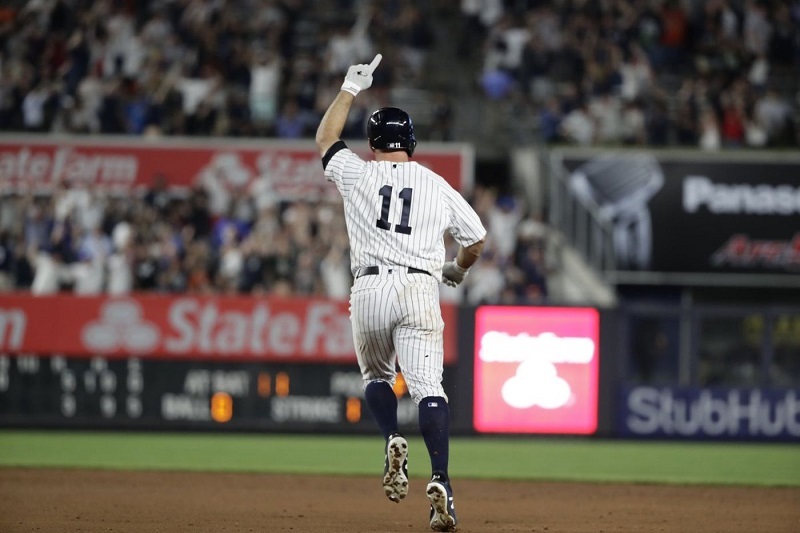 After a relatively quiet few days in the Bronx, wild and wacky baseball returned with a bang on Tuesday night, as the Yankees staged yet another epic comeback en route a 6-5 extra-inning win over the defending AL champs. 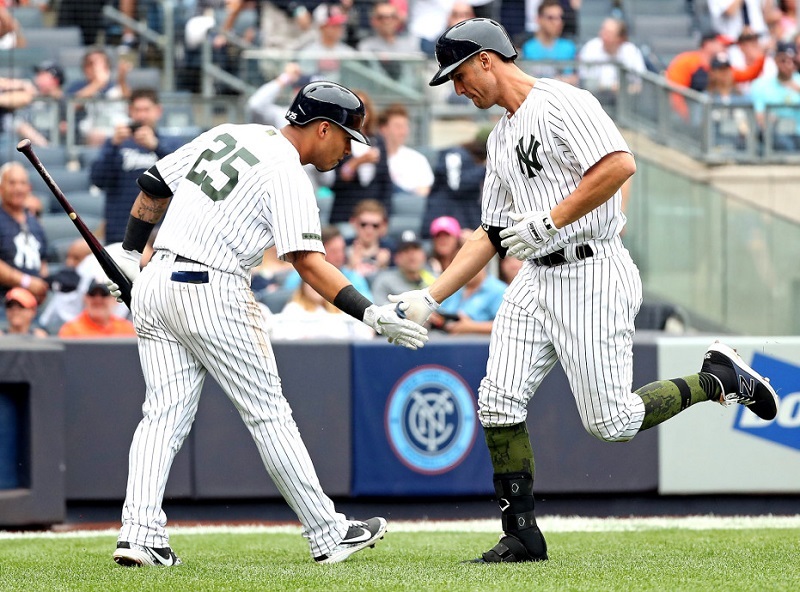 It was the Yankees AL-leading fifth walk-off win of the season, and also matched their entire total from last year. The only other time in the last 50 seasons that they compiled five-or-more walk-off wins within their first 52 games played was 2009. Sure the Yankees have been piling up these Fighting Spirit-fueled wins, but this one was perhaps the most improbable. The Yankees committed five errors — their most in a win in more than two decades (April 17, 1997 vs White Sox) — and also struck out a whopping 17 times. They are the first team since at least 1908 (and probably ever) to win a game despite making five or more errors and striking out at least 17 times. Congrats? Trailing 5-2 at the halfway point, the Yankees used their traditional power bats to save the game and then added a dose of Baby Bomber situational hitting to win it. Aaron Judge started the comeback with a 109.1 mph rocket into the second deck in right leading off the fifth inning. It was his fifth opposite-field homer of the season, and fourth with an exit velocity of at least 108 mph — that’s twice as many as anyone else through Tuesday. Brett Gardner made sure we’d enjoy free baseball with a thrilling two-run game-tying homer in the ninth inning. It was his second home run of the game, after he led off the night with a solo homer in the bottom of the first. That statistical combo gave us our Guest Yankeemetric of the Series, courtesy of stats maven Doug Kern: Gardner is the second Yankee ever to lead off the game with a home run and then hit game-tying or go-ahead homer in the ninth inning or later, joining Snuffy Stirnweiss on August 27, 1947 against the St. Louis Browns. Torres — at the age of 21 years and 163 days old — became the youngest Yankee with an extra-inning walk-off hit since Ben Chapman on April 25, 1930. And combined with his May 6 game-ending homer vs Cleveland, Torres also entered the record books as the youngest Yankee (since at least 1925) with multiple walk-off RBI in a single season. 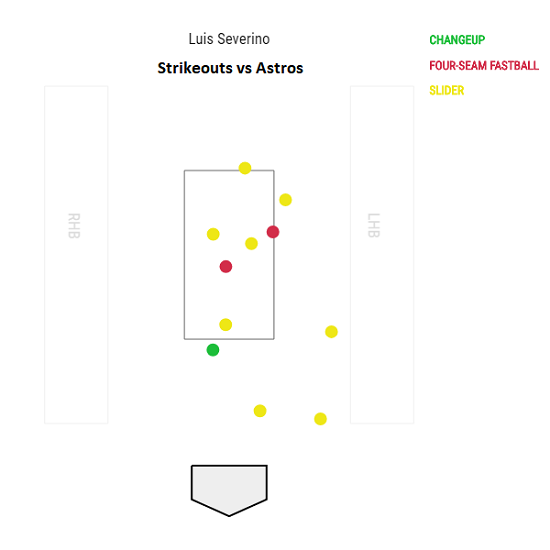 Luis Severino showcased his ace stuff as he struck out 11 batters and held the Astros to two runs on four hits over seven innings. All 11 of the punchouts were swinging — a career-best for Sevy — and eight of the 11 came on his slider. His masterful outing capped off a dominant month during which he struck out a total of 50 batters, whiffing 10-plus guys in three of six May starts. He is just fifth Yankee in the last 50 seasons with 50 or more strikeouts in a single calendar month. This list is pretty good, eh? Gary Sanchez delivered the game-changing blow in the fifth inning, a bases-loaded two-run single that turned a 2-1 deficit into a 3-2 lead. That hit snapped an 0-for-19 slump and was his first RBI since May 19. Sanchez has no fear when coming to plate with the bases juiced — he is now 11-for-22 (.500) with the bases loaded since the start of 2017, and has driven in 22 runs in those 22 at-bats. After series against the Rangers and Angels, let’s see how the Yankees do in a three-game home set with the class of the American League West. It’s been less than a month since the Yankees took three of four in Houston in the middle of their 17-1 stretch. 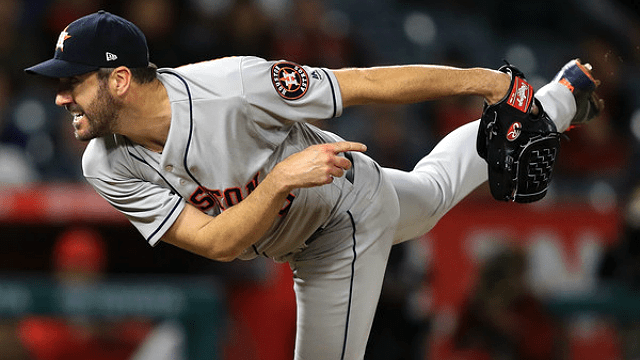 Charlie Morton handed them that one loss with a gem of a start in Game 1 and was followed by eight shutout innings from Justin Verlander in Game 2. Verlander’s 14-strikeout masterpiece was upended by Ken Giles’ woeful ninth-inning, culminating in a Gary Sanchez homer and a self-punch to the face for Giles. 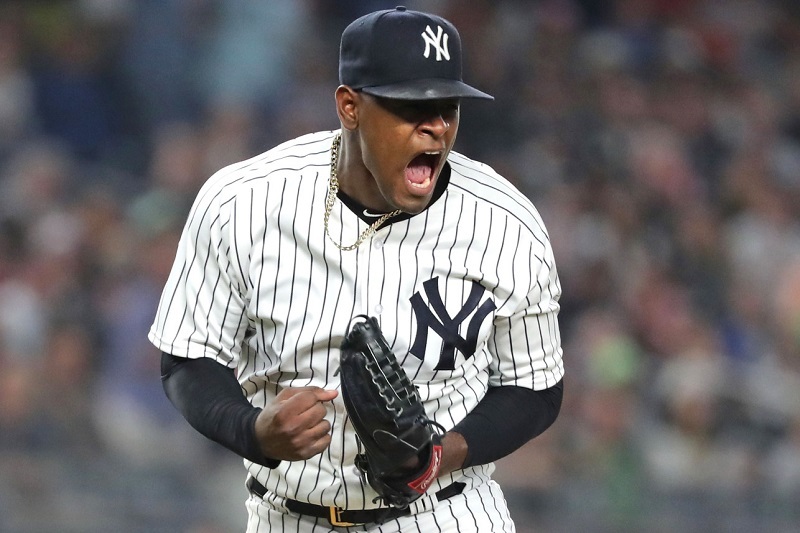 Giancarlo Stanton homered twice and Luis Severino shutout Houston in Game 3 before the Yankees survived a near bullpen collapse with a 6-5 comeback to take the series finale. 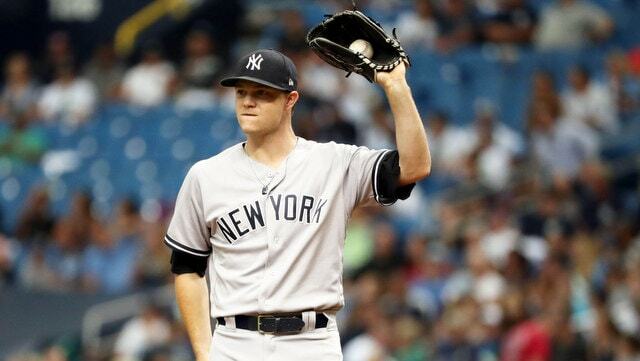 Jordan Montgomery went down with an injury after one inning in the second game, leading the Yankees to get eight innings of shutout relief from Domingo German and others. The Astros are mostly healthy. Josh Reddick has a left leg skin infection and will miss this series while fellow outfielder Derek Fisher (gastrointestinal discomfort) could return on Tuesday or Wednesday. The defending champions are 34-20 and they just might be better than that record. Their Pythagorean record has them at 41-13 because their pitching staff has held opponents to just 147 runs. No other American League team has held teams to fewer than 200 runs. Their offense hasn’t been quite as supercharged as the Yankees, but they still have the same group that produced last year’s title run. Jose Altuve again leads the AL in hits and the rest of the top four hitters in the lineup continue humming along. Verlander, Morton and Gerrit Cole are 1-2-3 in ERA among AL starters (Severino is fourth), leaving Dallas Keuchel and Lance McCullers Jr. as overqualified four and five starters. Their only weaknesses are their bullpen and maybe the back-end of their lineup. Don’t be surprised to see a lot of shuffling between McCann, Gattis and fellow catcher Max Stassi (149 wRC+), who has been the best hitter of the trio this season. Jake Marisnick (27 wRC+) may get a start over Kemp vs. CC Sabathia for platoon reasons despite a horrid start to the season. Verlander has had the best stretch of his career to start the 2018 season and is currently the Cy Young favorite, far and away. That’s what happens when you put up a 1.08 ERA over 74 2/3 innings. He’s averaging just short of seven innings a start and has a .710 WHIP to go with a career-best 28.1 K-BB%. If anything could fell him, it’s his career-low groundball rate. 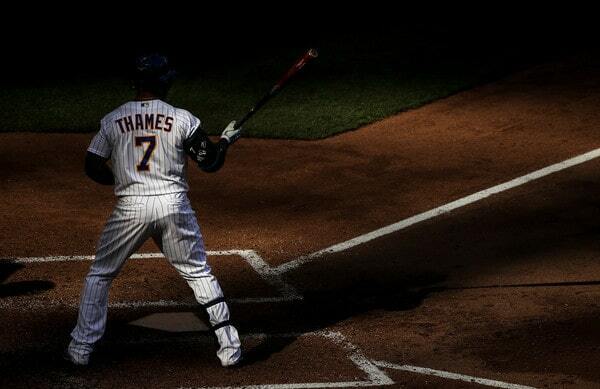 The Yankees are going to swing and miss a lot against him, so perhaps they poke a few out in the #littleasspark. They’ve had no luck in their three games vs. Verlander at Minute Made Park and haven’t faced him at Yankee Stadium since 2016 when their lone run came on a Rob Refsnyder RBI single. The current roster bats .190/.265/.321 against him with 50 strikeouts in 153 plate appearances. Morton has been similarly dominant to Verlander this season with a 2.04 ERA in 61 2/3 innings. That included 7 2/3 innings of two-hit, 10-strikeout ball on Apr. 30 against the Yankees, the lone loss for the Bombers in their 17-1 stretch. At 34 years old, Morton is somehow throwing harder than ever, averaging 96 mph on his fastball after throwing in the low 90s up until his brief stint with the Phillies two years ago. He favors assorted variations of his fastball while working off of it with an 80-mph curveball. He’s been a magician in Houston. It’s funny to say, but of any of the pitchers in this series, Keuchel is the one that has earned a reputation for a Yankee killer. He has a 1.74 ERA in his career against the Yankees and the current team bats just .202/.240/.319 against him. However, he’s lost his last two starts against the Yankees beginning with ALCS Game 5 last year. Maybe his Yankee stopping mojo is gone? Keuchel hasn’t been quite as good this season despite a strong 3.39 ERA in 69 innings. His groundball rate has fallen a bit and with that has come a few more home runs, including two by Stanton on May 2. He’s still a solid pitcher for Yankee Stadium with his worm killing stuff able to keep the ball out of seats. He’s allowed a reverse platoon split this season in a small sample that goes against his prior career numbers. Their bullpen has been a bit of a mess again this season, as the Yankees saw first hand a month ago. Ken Giles’ and Will Harris’ ERAs are up to 5.06 and 4.08, respectively, after contributing to Sunday’s meltdown in Cleveland, where the Astros blew a five-run lead in the ninth inning. Chris Devenski is same solid self and Brad Peacock has been solid despite allowing a walk-off homer yesterday. Beyond them, offseason addition Joe Smith has an unseemly 6.06 ERA in 19 appearances while Hector Rondon has been good in 21 games despite his blown save on Sunday. Collin McHugh has been a dominant long man after getting squeezed out of the rotation (though again, he gave up a run yesterday). McHugh is the type of guy you’ll forget about and then he’ll win the Astros a playoff game out of nowhere. Be on the lookout. The bullpen will be a bit shorthanded after everyone but Tony Sipp, the lone lefty, pitched on Sunday, including two innings each from Smith and McHugh. Definitely possible the team makes a quick roster move to add some short term help, though they could just rely on Verlander to go deep. McCullers’ father pitched for the Yankees from 1989-90 while Cole, as you likely know, was a first-round draft pick of the Yankees who didn’t sign despite growing up a Yankees fan. It was the right call considering he was picked first overall three years later. And, of course, McCann was in pinstripes for three solid seasons behind the plate. He hit a little too well in Games 6 and 7 of the 2017 ALCS for my liking, but I still have a soft spot for him. I think I’ve written this a half-dozen times now, but this is a measuring stick series. The Astros may have four more losses than the Yankees, but they’re just as formidable. The top four in the Astros’ lineup will make things happen on their own, so one key for this series will be how the Yankees handle their bottom five, particularly guys like Kemp in the nine-hole. If the Yanks keep them off the bases, that makes dealing with Springer through Correa much simpler.